I loved the pageantry, elegance, beauty, and genuine love we saw at the royal wedding. It was an emotional day, and it seemed like Princess Diana's spirit was present throughout. I was moved by the sight of Princes William and Harry riding in the Bentley together, smiling and waving at the crowds. Dashing military uniforms aside, the Princes seem like two perfectly normal brothers who are very close and love each other. Harry with his a little-too-big uniform, mischievous grin and tussled hair, looking backwards as his soon-to-be sister in law was making her way down the aisle, whispering to his brother,"Right, here she is now." William, nervously biting his lip just like his mother did. The bride was stunning and gorgeous. How touching that her groom whispered "You look beautiful" when she got to his side at the altar. The casualness and sense of humor with which he told his soon-to-be father-in-law, "We were supposed to just have a small family affair." 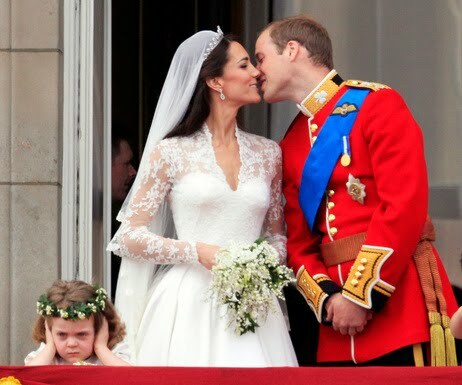 And who else but Diana's son would kiss his bride twice? Enough to briefly erase the memory of his parents' awkward balcony kiss. The new Duchess of Cambridge apparently loves nature, hence the lovely trees inside the Abbey. That was a nice touch, a splash of color. I also read that because all the couple really wanted was a small wedding at her local village church, this was their way of getting that same feel. I love that they don't have servants at the rented home they share. I heard on the radio that she took lessons and did her own make-up for the wedding as she didn't want to have more people fussing over her. I even loved seeing other royals in the party buses/coaches. And to see the Prince drive his bride himself, on an eco-friendly car at that. Again, a sharp contrast to that photo of his parents in that same car, with his father scolding his mother. The happy couple took a page from Diana's humanitarian work by asking for donations to their charitable organizations in lieu of gifts. All in all a joyous day. Even the Queen looked extremely happy. I hope to see Prince William become King. I think he'd make a great one. With Catherine at his side.